What do you get when you mix a womanizing Gilded Age architect, a teenage pin-up girl and a jealous millionaire husband? Murder, naturally — and a killer backstory for a new condominium development. The lush Flatiron District apartment grounds where Stanford White started the affair that led to his demise are getting a new life as luxury housing. Anbau Enterprises purchased the site at 22 W. 24th St. for $3.5 million from Gramercy Management LLC, The Wall Street Journal reported. Anbau bought a parking lot next to the W. 24th Street site last year, with plans to use the combined land for a 23-story building. The development, designed by the architect Carlos Zapata, will have 45 luxury apartments and will break ground in about a year. The original building that White occupied, which was damaged in a fire in 2003 and collapsed in 2007, was a key factor in White’s romancing of 16-year-old model, actress and chorus girl Evelyn Nesbit. In Nesbit’s memoir Prodigal Days, she described the apartment located above toy store FAO Schwarz as a dimly lit, ornate playground with rich red velvet curtains and elaborately carved furniture. Nesbit wrote that the first time she visited around 1901, she and White went two flights up the stairs into a green room, where she sat on a large, red velvet swing suspended from the ceiling by ivy-like ropes. A ten-by-ten-foot “mirror” room entirely covered in glass panels was allegedly where White later seduced Nesbit. In 1906, White was shot and instantly killed by Nesbit’s husband, Harry Kendall Thaw, during the theater show Mam’zelle Champagne at Madison Square Garden, which White designed. As the architect was shot, the finale, “I Could Love a Million Girls,” was playing. The court proceedings after White’s murder were deemed “The Trial of the Century.” The shooter, Harry Kendall Thaw, was deemed not guilty by reason of insanity. Stanford White was slain in Madison Square Garden, which he designed in the Renaissance Revival style. 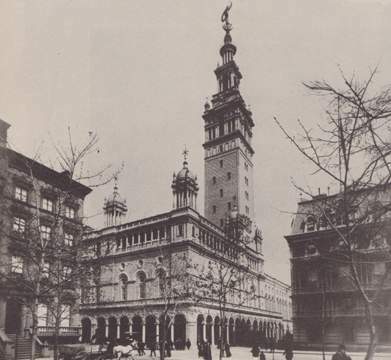 The building was demolished in 1925. Anbau Enterprises president Stephen Glascock was previously aware of the apartment’s scandalous past and happened to be in the area for dinner when the building collapsed, The Wall Street Journal reported. The new condo building will be in the triangular shape of a ship’s sail, a design that Zapata had previously made for a suspended hotel project. 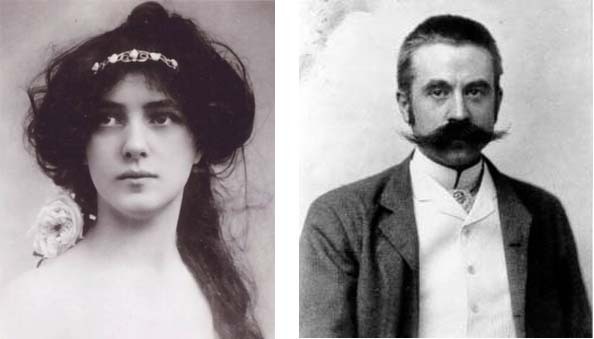 “Stanford White would be very happy,” Glascock told The Wall Street Journal. We hope the future residents will have better luck than White did. Corcoran Group SVP Sandy Tannenbaum suggested that the developer give every buyer a DVD of the “The Girl in the Red Velvet Swing” to keep the intrigue. “Or, have a private screening and invite me,” she tweeted. Better yet, how about a red velvet swing in every unit?